I do not know what happened but I promise when I took this photo it was rotated 90 degrees to the right so just tilt your head and it will be fine. 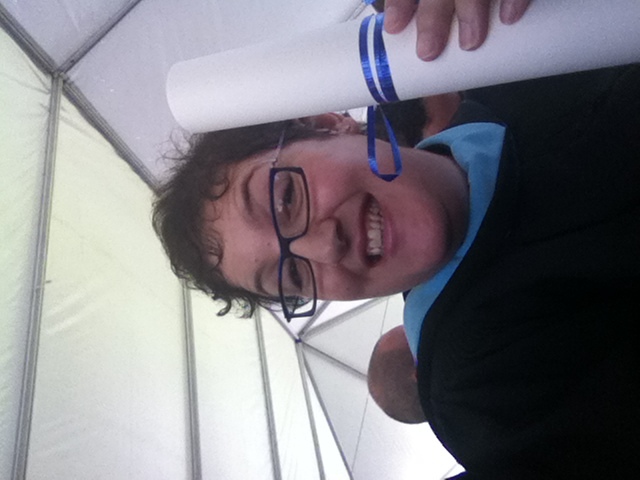 This is a picture of me just after I received my Masters of Arts in Jewish Education (MAJE) yesterday! (It is pure coincidence that my glasses, the bow on the diploma and my hood match). MY DAD, THE DIVA, BIRTHDAY BUDDY and many others were there to celebrate. I’m a lucky woman. This ceremony was different from the other graduations and ordinations because, as my family and beloved friends can attest, at my MAHL commencement and graduation both, I made activity books so that everyone could be entertained during a somewhat lengthy ceremony. This year, because of the popularity of the smart phone and iPad, I did not make such a book. I hear from the family that they were busy playing Scrabble (I’m so proud) and I live tweeted the ceremony. You can see that here. Many have asked what is next on the horizon and the answer is, “I am pursuing a lot of different opportunities and hope that something will something will come to fruition soon.” In other words, I am on the job hunt. If you know of a position that might be well-suited for me please let me know! Thanks to MY DAD, THE DIVA, my family of birth and choice for all of their support this past year as I went back to school. This entry was posted in family, memories, technology, work and tagged education, family, HUC. Bookmark the permalink. Mazal tov, Ellie! Hope something wonderful comes your way. I am off to Pardes for the year! What difference a year makes. Congrats on the Masters Degree. A wonderful accomplishment! SAC at Temple miss you and I send warm and fuzzy greetings. The CSA is starting really soon and we are so hungry for the organics. I am sure that you are living the spoiled life and eating local organics most of the year round. I hope that you think of us often. Marilyn (and Jeff) – Yes, we are still Frick and Frack in Toronto and loving it!